In a city where you can shoot for the moon and land amongst the stars, where you’re surrounded by five different languages at the local café any given morning, and where opportunity is right at your fingertips, architectural and aesthetic styles are no different. The city is a treasure trove of individual tastes and styles from around the world. In our Local Westside Multiple Listing service, we have 72 separate styles of homes we can find for you. LA is lucky to be home to many magnificent works by notably famous and also new and innovative architects. True “architecturals” will have the name of the architect attached to it and often referred to in conjunction with the surname of the original owner who commissioned the work. An Architectural has features that take into account more than the physical structure itself in terms of beauty and aesthetics, but also the environmental positioning — the impact and flow with nature and the surrounding environment. What sets Architecturals apart from the rest are the appreciation for intangible features such as color, sound, and flow. Mid-Century Modern homes were built between the 1930’s and 1960’s, and designed with the era’s classically futuristic point of view. 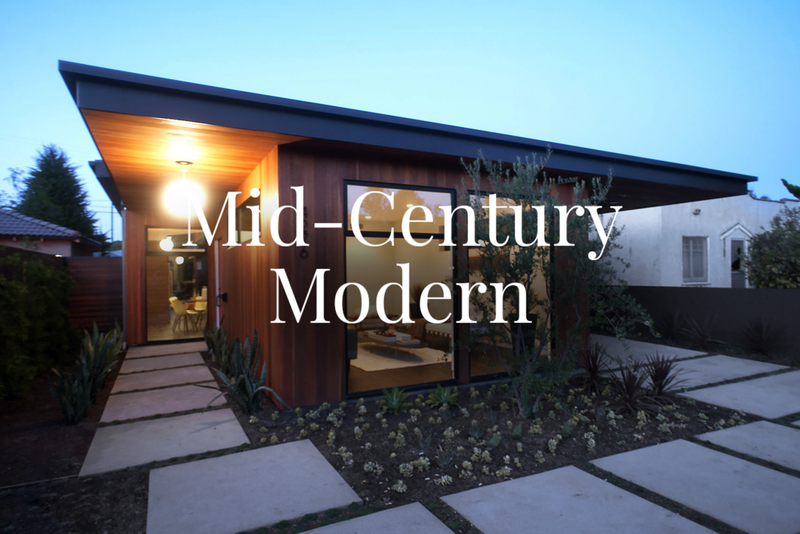 Today, the modern style of this era is a timeless design that has become a part of the Southern California landscape. Flat planes, large glass windows or giant sliding doors, and open spaces involving design and integration with nature create a minimalist appeal. The Post & Beam style of Mid-Century Modern homes eliminate walls and create larger spaces specifically designed with the average American family in mind. Akin to a restored car from the same era, a large following of homeowners and investors from Los Angeles all the way to Palm Springs purchase and restore Mid-Century Modern properties to maintain their classical design. In our market today, a modern home shares many similar features with Architecturals and can be identified as one with clean straight lines, sleek, high-end finishes and fixtures throughout, vaulted ceilings, and generous use of materials such as wood and steel combinations, cement, walls of windows and skylights for ample natural light, flat or pitched roofs, and a focus on indoor/outdoor flow. Currently, a very popular layout in Modern homes involve a “great room” where the kitchen is not separated from the family or entertaining areas by walls. The family room, dining room, and even living room all have open views to other areas in a large space with as little obstruction as possible. It’s a centerpiece in and of itself and set up with versatile use for family and guests to gather around for any and all occasions. Traditional homes preserve the architectural ideologies that date back to early colonial settlement. Today in LA, we can find beautiful, authentic Traditional style homes in their natural state or renovated to contemporary standards. True Traditional homes tend to be more formal in presentation with pitched shingled roofs, and an entry porch with a decorated front door. Upon entry, a foyer presents a bold staircase to a second level and a central hall plan leading you to clearly designated formal and separated public spaces. Secondary rooms such as the den, library, dining, or family rooms might contain a centerpiece fireplace with an elaborate mantel and paneling along the walls. These homes lend a charming and historical flair to Los Angeles, even if we don’t need the pitched roofs to keep the snow off. A substyle of the East Coast Traditional Home, the New England inspired style has similar features as Craftsman and Traditional styles. Formal and simple, Cape Cod homes were originally built to withstand the stormy weather of the new England Coast with pitched gable roofs, broad profile, and classic siding exteriors. 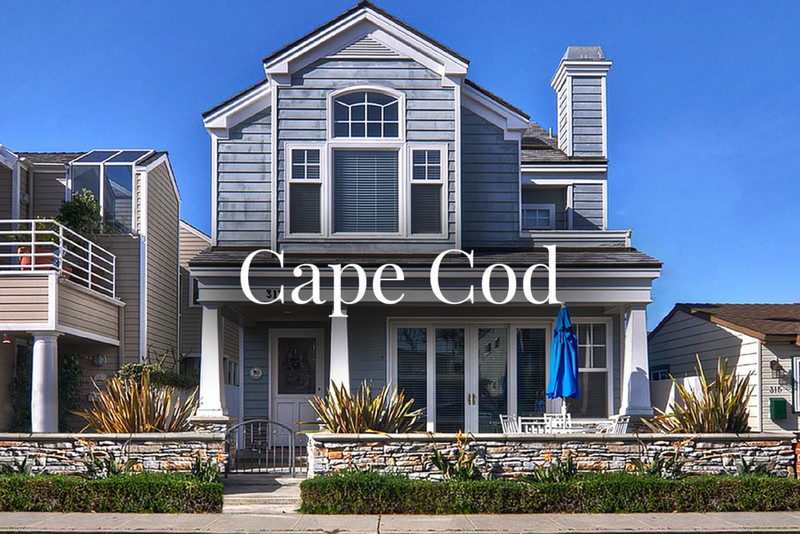 Classic Cape Cod homes are characterized by a two-storied, efficient, cozy, simple and symmetrical look. It’s the “All-American” cottage style with formal separated rooms. However, today’s Modern Cape Cods offer the Modern architectural characteristic of a “Great Room” design where the open family room and breakfast area blend into the space of the kitchen for shared space and time with loved ones. There are still modern Cape Cods that retain the formal and separate Dining and Living rooms. 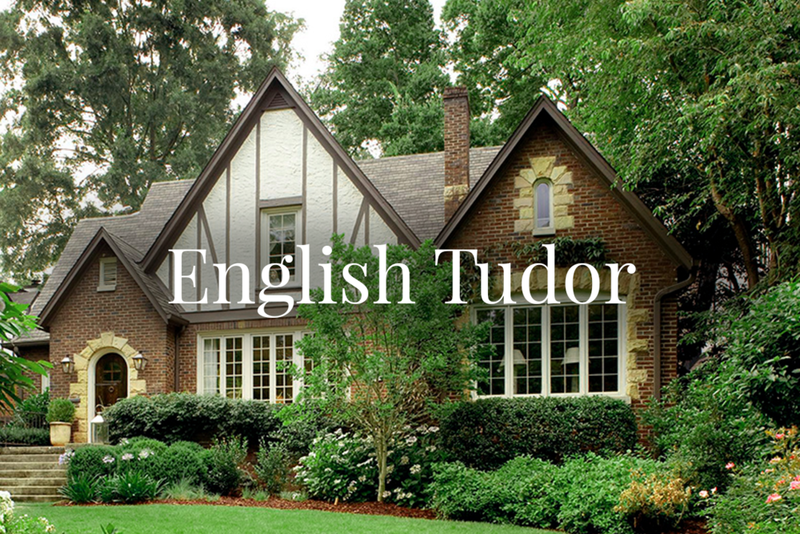 From medieval to modern, staunch and stately to whimsical, the varieties of English Tudor homes are scattered throughout all of LA’s prime neighborhoods. Façades are often red and brown due to the brick masonry and wood accents. In the 1920’s they became the symbol of wealth and security in Washington DC, and have since inspired homes in LA to recreate the appeal of “status.” Their playfully elaborate masonry chimneys, doorways with embellished ironwork, window groupings, and decorative exterior wood timbers that accent stucco or masonry are all hallmarks of an English Tudor home and reminiscent of storybook settings. 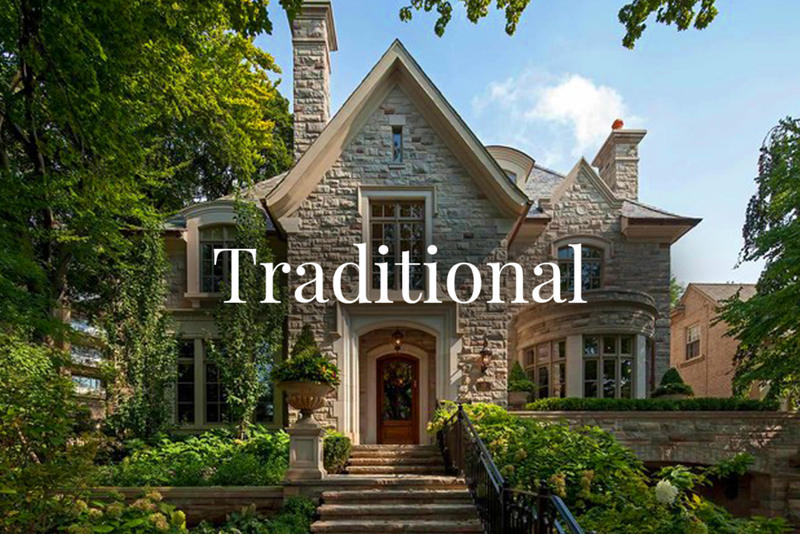 Originally from 16th Century England, this architectural style is revived all over the city blossoming in the late 19th century and continues to be a part of the neighborhood landscape today. Ornate and rustic, the Mediterranean architecture comes to us from the influences of Italy and Spain where stone paved streets and flowering vines abound. We also differentiate Spanish Style Architecture from Mediterranean as there are some specific, subtle differences. 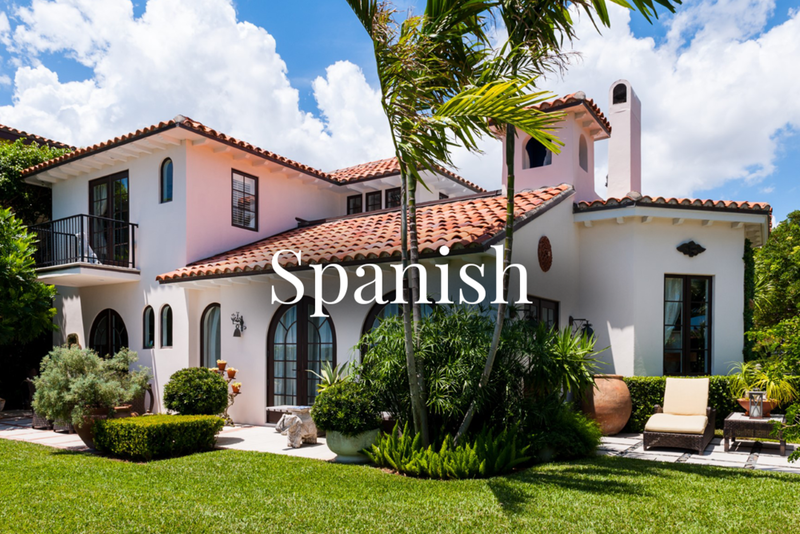 All Spanish Architecture can be called Mediterranean, but not all Mediterranean can be called Spanish. Mediterranean style homes are characterized by symmetry of the façade, more delicate detail and ornamentation of the exterior trim such as balustrades, windows, and doors. In a sense, Mediterranean is a more “feminine” presence next to the more masculine Spanish architecture. Inside, spacious floor plans are accented with curved arches, columns, and sometimes integrated with the outdoors using courtyards, terraces, and balconies. For the lover of the authentic, charming, and rustic, Spanish architecture takes you away from the city and into a wonderland of visual comforts. Splashes of color liven up an otherwise clean backdrop of white walls with wood. Stone or tile floors, and characteristically beamed ceilings bring to life a more romantic region of the world. Variations of the Spanish architecture include the Spanish Colonial, Spanish Revival, Gothic, and Baroque. Like other styles originating outside of California, Spanish homes were designed to counter Spain’s hot climate. The roofing materials and space elements were meant to keep the interior spaces cool, with a floor plan that prefers single level sprawl as opposed to higher storied compactness. Think Paris. White powdered wigs and champagne, finely carved details and opulent décor. French homes -- sometimes called, Normandy French, Victorian French, Country French, or French Provincial — arrived from the more romantic architectural periods of Europe and brought over France’s particular brand of luxurious, yet often rustic, countryside charm. Because of their stately and timeless beauty, one could consider them petite chateaus where refined elegance is around every corner. In two-story homes, a grand staircase is dressed in ornate iron décor. Though the French style is not as abundant in Los Angeles as Mediterranean or Spanish, authentic models do exist. Originally inspired by its native versions in Switzerland and the snow covered Alpine regions of Central Europe, these homes are mostly made of wood, with heavy, generous eaves set at right angles to the front of the house to invoke the feeling of warmth and unity with nature via large windows. Often built on a hillside, facades are richly decorated with unfinished red wood, numerous balconies, and decorative carvings. Inside blazes a large central fireplace and exposed steps and beams within voluminous living spaces. Today, we find Chalet styled cozy bungalows, to mansions in Beverly Hills, and many large scale ski and vacation resorts. 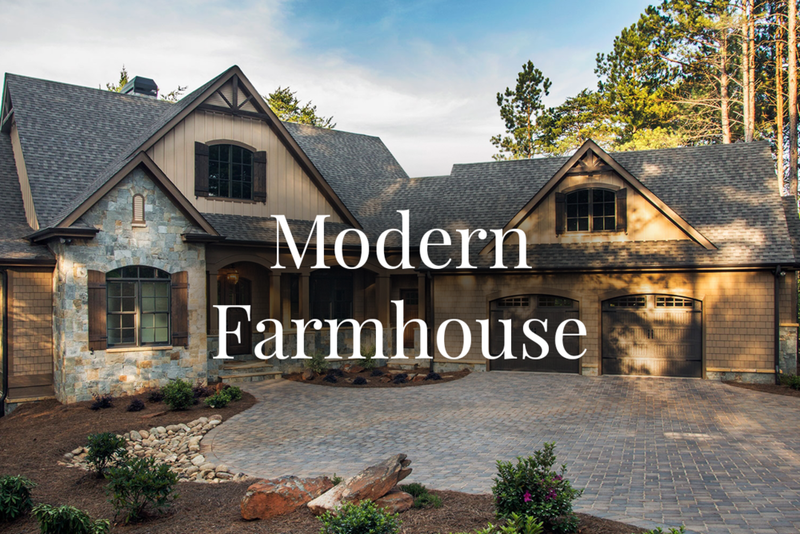 The casual elegance of the Modern Farm House has been quickly gaining in popularity and demand throughout our LA neighborhoods. It has a great visual appeal and brings back images from the past, recreating the unique atmosphere and harmony of the time. The warmth of natural woods, soft colors, oversized central fireplace, beamed ceiling, spacious functional kitchens and the spectacular use of interior stone work and neutral textiles - with the quintessential claw foot tub as the iconic bathroom accessory – all this creates a lovely welcoming place that invites you to stay and makes you feel at home. Regardless of their architectural style, the following property styles are used to classify a home or condo in broader terms. Single Family Residence are properties zoned to have a single, detached home on one designated lot. Lot size can range from 2500 square feet for “zero lot line” SFR developments to multiple acres, on flat land or in the hills. Unit in a multi-unit building or complex usually paying a monthly association fee as an individual owner, in exchange for any or all of the following: maintenance of the common areas, access to amenities, property insurance coverage, utilities, or security services. A “Town house” is describing a condo unit that is 2 stories in structure. A property structure or structures on one single lot, which can house 2 to 4 separate residential units, each as an independently operating address. Often referred to as “Income Property” as the units are most often rented out as a source of income for the owner. Mostly available in Downtown LA, authentic lofts are condo units in older industrial buildings that have been converted to living spaces. They are characterized by having fewer separated spaces creating an open floor plan, an abundance of exposed ventilation piping in high ceilings, cement, interior brick work, and usually located in a high rise security building in a completely urban setting. Usually used to describe the lavishness or to denote a high-end, sophisticated level of a property, or larger size of the estate in general. They can be a Spanish Villa, French, Modern, or Mediterranean Villa. Often Villas have European features such as a courtyard. A “tear-down” mostly refers to the condition of the property - one that is in such disrepair that the best use for it is to tear it down and rebuild a new property in its place.